Parabola is an example of a Linux-using GNU variant endorsed by the FSF as a "fully free" system. As of 2018, the only GNU variants recommended by the GNU project for regular use are Linux distributions committed to the Free System Distribution Guidelines; most of which refer to themselves as "GNU/Linux" (like Debian), and actually use a deblobbed version of Linux (like Linux-libre) and not Linux per se. GNU Bash running on Windows 10. ^ "Guix: A New Package Manager & GNU Distribution - Phoronix". www.phoronix.com. Retrieved 2018-04-02. ^ a b UG, Awesome Developers. "Source Code & GPL Open Source". www.snom.com. Retrieved 2018-04-08. Variants of the GNU operating system, which use the kernel Linux, are now widely used; though these systems are often referred to as "Linux", they are more accurately called "GNU/Linux systems". ^ "The GNU Operating System". LinuxReviews. Retrieved 2018-04-02. ^ "Outreachy internships working with GNU Guix". www.outreachy.org. Retrieved 2018-04-02. 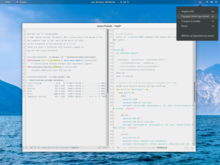 ^ "13 Lightweight Linux Distributions to Give Your Old PC a New Lease of Life". MakeUseOf. Retrieved 2018-04-02. ^ Stallman, Richard (2007-06-19). "Linux and the GNU Project". About the GNU Project. Free Software Foundation. Retrieved 2007-07-22. ^ The Debian Project (2007-07-11). "What is Debian?". About Debian. Retrieved 2007-07-22. ^ "Free GNU/Linux distributions". gnu.org. 2017-12-22. ^ "Debian 6.0 Squeeze released". ^ "The Ging FAQ". Archived from the original on 2008-04-22. Retrieved 2008-02-22. ^ "Debian GNU/NetBSD". Debian.org. Retrieved 2012-07-20. ^ "Debian GNU/NetBSD for Alpha". Debian.org. Retrieved 2012-07-20. ^ "Debian GNU/*BSD News". Debian.org. Retrieved 2012-07-20. ^ Nexenta Systems, Inc. (2007-06-20). "Unix Portal:Nexenta OS - Nexenta OpenSolaris". Sponsors & Support. Archived from the original on 2007-07-11. Retrieved 2007-07-22. This work is initiated and sponsored by Nexenta Systems, Inc. Technical support is available from a variety of sources, including Community and Web Forums. ^ "Why Microsoft Making Linux Apps Run on Windows Isn't Crazy". WIRED. Retrieved 2018-04-08. ^ scooley. "Frequently Asked Questions (FAQ)". docs.microsoft.com. Retrieved 2018-04-08. ^ Rogoff, Zak (2018-03-14). "Thoughts on GNU/kWindows — GNU programs running natively on top of the Windows kernel". Medium. Retrieved 2018-04-08.